Online booking is available 24/7 via our website. You can book your tickets by calling our Box Office on 01242 850270. The Box Office opening times are subject to change during festival times. Please visit the Box Office page for the most up to date opening times. All telephone bookings must be paid for by credit or debit card at the time of placing the order. We cannot reserve tickets for any event. We do not accept orders made by post or email, please book by one of the aforementioned methods. Post and email ticket requests will not be processed. All ticket orders are subject to booking fees. Booking fees apply per order and not per ticket. By card: We accept payments by Visa, Mastercard and Maestro. We cannot take payment by American Express or Diners Card. By cheque: Cheques must be made payable to CF Productions. 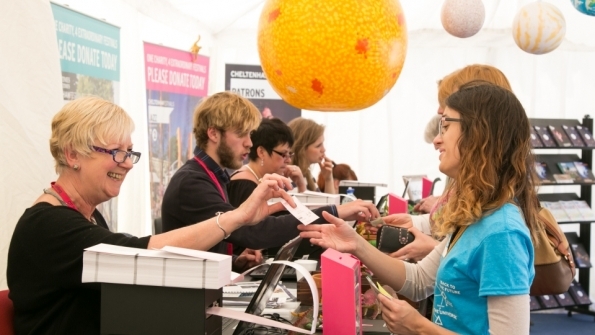 Cheltenham Festivals is a not for profit organisation and we rely on contributions from customers to ensure the continuation of the festivals each year. We ask all our supporters if they are able to help us with a donation when they are booking with us and we suggest an amount of 10% of the order total. We endeavour to offer reserved seating wherever possible. In order to give you the best experience at our festivals and to speed up the booking process, our system automatically selects the best seat(s) available for your chosen event. As acoustics and sight lines vary at each venue, the festival team have carefully tailored the way that the system assigns your seats for each event. Your seat numbers are referenced in your confirmation email and printed on your tickets. If you have any particular access requirements please let the box office know and we can find the best seats for events to accommodate your needs. Please call our Box Office team on 01242 850270. You can access the Access Requirements Booking Form for the Jazz and Music Festival 2019 by clicking the links below. Tickets for customers who are registered disabled will be charged the standard price of the ticket. If you require a carer, their ticket is complimentary.